September 6, 2012 Vancouver, Canada -- El Niño Ventures Inc. ("ELN" and the "Company") (TSX.V: ELN; Frankfurt: E7Q; OTCQX: ELNOF) is pleased to announce that Murray Brook Minerals Inc. ("MBM") has been given formal notice by both ELN and Votorantim Metals Canada Inc. ("VMC") that a 70% earned interest in the Murray Brook polymetalic project, Bathurst, New Brunswick has been completed. ELN and VMC currently own 70% of the project, of which 35% is held by each of the two parties. Under a purchase agreement signed by VMC on August 28, 2012 with MBM and Murray Brook Resources Inc. (collectively the owners), VMC acquired the right to purchase the additional 30% of the Murray Brook Project from the owners. ELN has been provided the option to earn an additional 15% in the project for a combined total of 50% (35% +15%). Management of ELN is currently evaluating the proposal of this option and the terms of the Purchase Agreement. In order for ELN to earn its 35% it has provided VMC with a total of $2,250,000 as its share of 50% in expenditures costs. This amount consists of $1,125,000 for its initial 25% earn-in expenditures and a further $1,125,000 for the additional 10% earn-in. Although the terms of the Participation Agreement provided for a three-year period to earn the initial 50% and two years to earn the additional 20%, ELN and VMC completed their earn-in in less than 18 months. Encouraging drill results and a very positive NI 43-101 resource estimation accelerated the exploration and development programs and is a testament to both ELN and Votorantim's commitment to aggressively advancing the project (see ELN press releases dated: February 28 and May 17, June 5, June 27, July 17, July 30, August 14 and August 28, 2012). As a private Company, MBM has requested that the terms and conditions of the purchase agreement remain confidential until the option to purchase the additional 30% has been finalized. On another matter, the Company further announces that it will not be proceeding with the current brokered private placement with Desjardins Securities Inc. The Murray Brook Project is historically the 5th largest massive sulfide deposit in the Bathurst Mining Camp and has excellent infrastructure (Figure 1). During 2011 and 2012, ELN and VMC completed more than 28,000 metres of drilling with encouraging results. The 2012 drill program was completed in June. A recently completed (February 2012) NI 43-101 Mineral Resource Estimate for the Murray Brook Zn-Cu-Pb-Ag-Au deposit, which includes explanatory footnotes, is presented below. The resource estimate is based on various assumptions regarding mining methods, processing and metal recoveries, payable metal NSR credits and metal prices. This estimate makes no provision for capital costs to mine the deposit, nor mill the material mined, as resources are not reserves and the reader should not presume economic viability. The Technical Report on the 2012 NI 43-101 Mineral Resource Estimate is filed on SEDAR.com and is available on ELN's website. 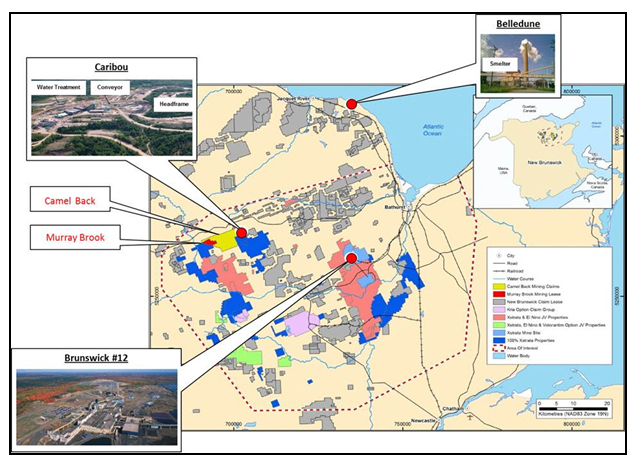 Phase 2 of Metallurgical studies (Pilot Plant), Preliminary Economic Assessment Studies, Geotechnical drilling, detailed delineation of base of oxidation and Environmental assessment studies are slated for completion in 2013. Murray Brook Minerals Inc. is a privately owned mining exploration company which holds interests in properties in the Bathurst Mining Camp including the Murray Brook Project and Legacy Copper Deposit.